"A trio of reds from the 4th in front of old style basket wine bottles." We spent the 4th of July weekend down in Georgia at my parent’s house on beautiful Lake Okonee. It was not quite as hot as NYC and we had some great food and tried a bunch of different wines from my parents wine cellar, aka, the basement. 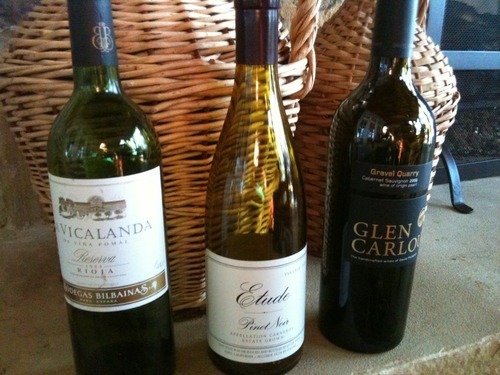 I will review the three reds pictured here, but we had several other wines, most notably a 2008 Luli Santa Lucia Highlands California Chardonnay, that was fantastic. It sells for about $17-22 give or take and was absolutely delicious and instantly loved by all. This Glen Carlou Cabernet was the corker of the bunch, I loved it. Lots of great character and balance. It supposedly retails for around $45 so it seems a bit out of reach for a go to Cabernet, but if this bottle was coming out of California it would probably be a cult cab at double the price. It is no secret that I love the wines of South Africa, and this one is not exception. 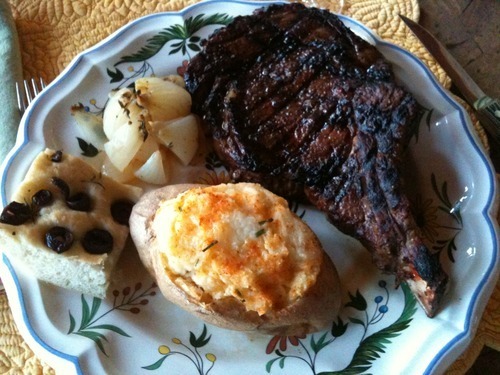 "A big ole' cowboy steak, twice baked potatoes, roasted vidalia onions, and homemade focacia. Thanks mom!"